Austria, Film & the influence on Hollywood. I couldn't finish this. 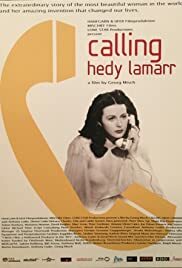 I struggled through 3/4s and then came a sequence of fast cutting between actresses saying "*I* am Hedy Lamarr! ", "I AM Hedy Lamarr!" "I am HEDY Lamarr" for what seemed like two minutes. Then I turned it off. I get that you want to play around with the documentary format. You want to create something different and new. Good for you. That's admirable. But when the vast majority of your movie is people talking on the phone and you're not sure who their talking to the effect is that you're stacking the deck and creating a narrative that didn't happen. It feels fake. It comes off like the records in the 50's and 70's where someone would ask a question and the response would be a line from a popular song. The focus doesn't seem to be on Lamarr but on her son, the filmmaker. "I wanted to be an actor but I couldn't make it pay." So...you decided to make money in another field and then make some weird, incestuous film about your mom? You film yourself talking about how you want your movie to look...after you've played the sequence you've already made? What was the point of filming auditions for the role of your mother when most of them shouldn't have been there? There's one sequence where he's talking to an actress portraying an older version of his mom...and he's having a conversation with her as if she's actually his mom. You can do a lot of therapy that's more productive and cost effective than making a movie about how mommy didn't love you. Worst of all, he just throws all of the information out there and does nothing to sort it all out. Apparently, he interviewed people who knew her rather who tell radically different stories about who she was. No matter how horrible a mother she was, he should be able to bring some kind of perspective to these differing opinions but instead he just lets them talk...on the phone...maybe to each other...or maybe he's on the other side of the phone. We don't know. We know there's a camera crew filming them but we have no idea where he, as the filmmaker is. There are awkward passages of him talking on the phone, obviously trying to act. "Yes. Mr. Spielberg?" No. You didn't get that call through. This is a desperate and desperately sad movie starring (and I mean starring) an unloved son who's trying to compete with his mom.